As part of a series on small business, entrepreneur Luke Johnson tells BBC News Online how he has learnt from his mistakes. Had Luke Johnson been born 400 years ago, he may have been easier to categorise. Most widely known for taking the Pizza Express restaurant chain onto the stock market, he now runs the Signature Restaurants group, is a director of the dental group Integrated Dental Holdings (IDH) and is involved in a host of other companies, including a recruitment firm and the Reflex fitness chain. He'd prefer "projector" - the 17th century term, he tells me, for a man involved in many different businesses. "They were so-called because they had projects. As you get older, you start reading obituaries. "I think those who've been involved in different things are the most interesting." Apt enough for a man whose projects include running Signature's Belgo and Strada chains, and a collection of upmarket eateries including the fashionable Ivy, Le Caprice and J Sheekey. He's run a scenery manufacturer, and been a director of English Classic Cars and the investment vehicle Intrinsic Value. He also writes a weekly column for the Sunday Telegraph, appropriately titled "The Maverick". His entrepreneurial leanings started almost by chance. While at Oxford, he joined fellow medical student Hugh Osmond - founder of the Punch Taverns pub group - to run the Era nightclub. "It happened by accident really. We were most interested in having parties and meeting girls." His projects continued after graduation in 1983, when the milk round took him into advertising, and then to the City where he worked as an analyst. "All the time I was moonlighting," says Mr Johnson, whose interests at the time ranged from software firms to pubs. Joining Pizza Express in 1992 he defines as "the transforming deal of my life". "I took the view that everything until then had been apprenticeships." Mr Johnson began stalking the restaurant chain in 1990 and eventually floated the company on the London Stock Exchange in 1993. But last week he walked away from his much-heralded attempt to buy back the company that had planted him so firmly in the restaurant arena. "It's hard because you can get sucked in emotionally. 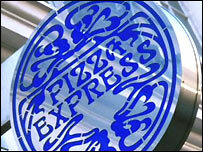 "More than ever before, I think Pizza Express has got a lot of work to do because of the competition." But he's not disappointed - "[That's] when you pay too much, then it goes wrong and you lose money." Losing money, however, has been an occupational hazard. "There have been lots of disasters. But in many ways you learn more from your mistakes." IDH has been struggling against a shortage of dentists, the restaurant market is tough, particularly in London, and Signature Restaurants floundered on the stock market. Yet Mr Johnson is philosophical. "I think now I'd possibly say take more risks - but minimise the downside." 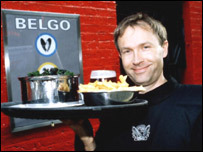 He left Pizza Express in 1999 and turned his focus to the Belgo chain of mussels and chips restaurants. The chain expanded overseas but he took it private last year after its shares dwindled in value. "The stock market wasn't doing the company any good and we weren't doing the market any favours." After more than 10 years in the leisure sector, Mr Johnson says his future projects are likely to be in the same area. "It's hard work but it's what I know and where I have some credibility. "And people aren't going to stop going to bingo halls, or restaurants or pubs." He has years of projects to draw on and the benefit of hindsight to advise budding "projectors". "Concentrate more - I could be accused of being slightly dilettante. "Don't be too impatient. Losing one's temper could be said to go with the territory. "But if you're not persistent, you won't succeed." Who is Britain's best entrepreneur? Richard Branson, Stelios Haji-Ioannou, James Dyson or Anita Roddick? Are there better candidates? We want to hear about them! Based on your suggestions we will draw up a shortlist, and then give you a chance to vote on who is the greatest entrepreneur of all time.